Truth be told, there are not a lot of YA Thrillers that impress me. They always usually have a great plot, a great beginning but somehow manage to fall flat in the middle and the ending ALMOST always disappoints. 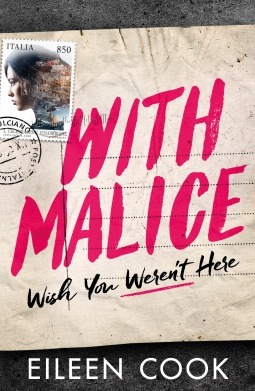 And while I really REALLY loved the sound of With Malice, I was what you can call cautiously optimistic. 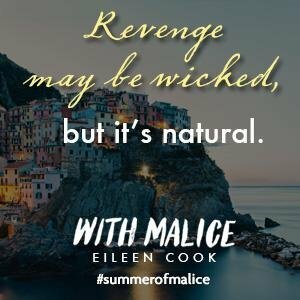 Within the first 80 pages, I knew I was falling in love; in love with the authentic feeling to what the MC, Jill Charron, was describing, the sheer research I could see had gone into the book, the subtlety of Cook’s writing but most of all the underlying promise that there was SO MUCH I DIDN’T KNOW! And I couldn’t WAIT to find out! Jill Charron is your standard good, overachieving girl. Headed for Yale, perfect GPA and Feminist – she has all the makings of a bright future. 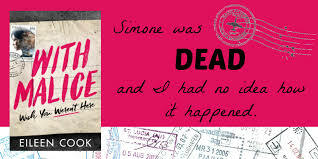 Simone McIvory is the exact opposite – popular, in the centre of all the fun and a boy magnet. And yet, somehow, these two different girls have been friends for over a decade. And yet, when Jill wakes up in a hospital bed, with six months of memories missing, an inability to pull words out of her brain, her parents tiptoeing around her and no best friend at her side, she knows something is very wrong. Except for the ending, where I felt like Jill was NOT being the person she’d been describing herself as all along, THIS BOOK WAS SO MUCH MORE THAN I EXPECTED IT TO BE! 1. The Subtle Writing: There was nothing flamboyant about Cook’s writing, but it was scary and accurate and somehow managed to come off as lyrical and honest and, well, there is nothing better than a well written book! 2. The Layout of the Book: Filled with not only Jill’s hazy memory, but also Police interviews, media interviews and blog posts, Cook managed to give off a holistic approach to what a case like this looks like to everyone else and what it feels like to the people involved. It was beautiful, and nothing like I’ve ever read before! 3. The Characters: I LOVED EVERYBODY IN THIS BOOK. The internet trolls, the terrible father, the lawyer, both Jill and Simone and Anna and the doctors – EVERYONE! They seemed like SUCH realistic people – flawed, but REAL. It was wonderful. 4. The Medical Authenticity: It’s very difficult to make me medically believe what someone is going through because most of the time, I just can’t feel it (and I watch a TON of Grey’s Anatomy), but THIS WAS AUTHENTICALLY DONE. The Aphasia (inability to remember words after a trauma) and the memory loss and Dr. Weeks with her AMAZING explanations of everything really made me, the reader as Jill, understand! 5. The Twists: While there were SO MANY twists and turns, I love that it was all relayed without an overdramatic narrator, but with soft impactful blows. With Malice is a beautifully written account on friendship, jealousy and media influence in a world addicted to the internet and voicing their opinions on every matter there is. I loved every second of this thriller, SO GO READ IT ALREADY! What was the last thriller you read and fell in love with? Do you usually read thrillers? What do you think of YA Thrillers?